Dyanna Spa in Manhattan New York offers expert underarm waxing hair removal services for men and women. Dyanna Spa & Nail Salon in New York City excels at underarm waxing hair removal services. Everyone who does it knows that shaving their underarms is a hassle, and that it can result in nicks, irritation, and redness. Underarm shaving also causes other little miseries like ingrown hairs, the clean shave “shadow”, and itchy skin as the hair grows back. Also, each time you shave, you strengthen the hair follicles and the hair comes back faster and thicker. Unless you live in other countries or within other cultures where underarm hair is the norm, yours constitutes unwanted body hair.But have no fear. N.Y.C.’s Dyanna Spa and Nail Salon can take of your underarm hair efficiently and at an affordable price. Underarm wax treatments are easy, safe, and fast. Waxing acts as an exfoliant by removing dead skin cells, which cause dry skin and in-grown hairs. In addition, waxing thins your underarm hair, making it softer, finer, and weaker. Each time you have your underarm hair treatment, it becomes even easier as waxing weakens the hair roots and represses hair growth. This means your underarm waxing treatments become fewer and further between. Our waxing estheticians are professional and experienced. When you come to our Manhattan beauty spa, you will be escorted into a comfortable private room for your spa treatment. Our wax technician applies our special Azulene wax formula strips under both arms, and within moments, all unwanted hair is gone. (If you have extremely sensitive skin, our esthetician will use the gentler Cirepil Blue Hard Wax.) It’s that simple! Dyanna Spa’s underarm waxing services are extremely affordable. 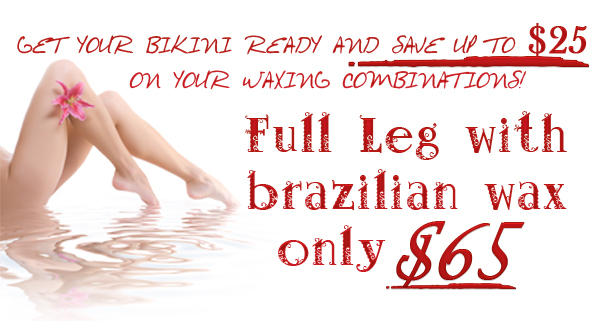 For women, Azulene waxing costs $10.00, and Cirepil Blue Hard Wax costs only $20.00. For men, Azulene underarm waxing is $20.00, and Cirepil Blue Hard Wax costs $40.00. Remember, the more you wax, the less frequently you will need to bother with it at all. Make underarm shaving a relic of the past. Schedule an appointment now for your day at the spa, and experience the ease and skill of our expert underarm waxing professional staff.